Pants are lame, and Dockers® are the lamest pants we can think of. They’re so lame that we decided to come out with a Utilikilt so sleek, clean, and stylish that your Docker wearing friends will cry in secret shame. 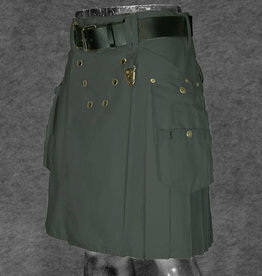 Design a cleaner, more refined looking Utilikilt that wouldn’t seem out of place at the office or with a shirt and tie. Put in enough hidden cargo space to please even the most demanding Utilikiltarian. 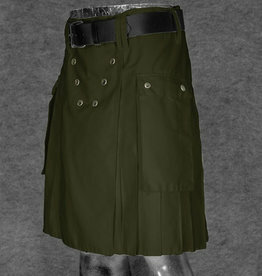 For the Mocker, we took off the side cargo pockets found on other Utilikilts. (It seemed a shame to hide all those beautiful pleats.) Then we designed absolutely cavernous slanted internal pockets to hold all your gear. And unlike a pair of pants, you can load your Mocker up with a ton of stuff without showing any sort of distracting bulge. The lines of the Mocker stay clean no matter what you carry around. The Mocker’s pockets have been designed so that when you sit down all your stuff falls safely to the inside of your thigh. These things are secure. No more stuff falling out of your pockets and getting left behind in that restaurant booth. Heck, go ahead and do a cartwheel. You might lose your pride, but your stuff is staying where it’s supposed to. The Black, Gray, Navy, and Pinstripe Mockers are constructed out of an 7.5 oz, 65/35 Poly/Cotton Twill. The Tan and Basil Mockers are constructed out of 9 oz, 100% cotton Twill. Buy a Mocker and burn your Dockers® in the name of freedom! !